The book is a practical, hands-on experience in building web applications based on XML and Java technologies. This book is unique because it teaches the technologies by using them to build a web chat project throughout the book. The project is explained in great detail, after the reader is shown how to get and install the necessary tools to be able to customize this project and build other web applications. 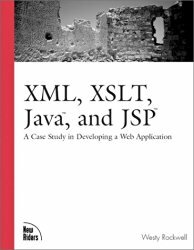 Of particular interest to readers will be the author's use in of XML in the book project as a language to express the architecture and design of the application itself, and not only the data content as is the usual case with "XML-based" applications. The book also contains some new and provocative techniques for XML storage using Java objects. The CD-ROM contains the web application project discussed in the book, which is a web chat called "bonForum." The complete source code is also provided. The files in the project consist of Java source and class files, HTML, JSP, XML, XSL, TLD, and image files.